Check out the 2016-2017 Olympia Adventure Speaker Series line up. It's guaranteed to inspire you to think outside the box for your next adventure. Join the Olympia branch on the first Wednesday of every month, from September through May, at the Friends Meeting House at Priest Point for a potluck and talk as part of our Adventure Speaker Series. 5:45pm Potluck: The meal begins promptly at 6pm. Bring a dish to share and your own plate and flatware. 6:15pm Social: grab a hot drink, check out or return Mountaineer library books, connect with our great outdoor community. Come early for all activities or arrive no later then 6:45 for the Adventure Speaker. The Tour du Mont Blanc is a classic European trek that winds around the Mont Blanc massif, traversing through the French, Italian, and Swiss high Alps. The circuit is 110 miles in length, and rises and falls over 30,000 feet in elevation along the ever changing mountain panoramas. Join Mountaineer member Laurie Choate as she shares her 10 day adventure with her daughter, Katie, on this spectacular hike. Carrying only a day pack, Katie and Laurie enjoyed mountain huts, alpine villages, snow capped peaks, and endless glaciers as they hiked through pristine valleys and over dramatic mountain passes. If you think hiking in the Alps is beyond your grasp, come learn how anyone with reasonable fitness can enjoy this classic trek. Laurie will be sharing her lessons learned and give helpful hints as you plan your own adventure. RSVP encouraged but not required. RSVP today. Join Zachary Brown (PhD, Stanford University, Arctic climate science) as he speaks about his efforts to create an institute for education and research in wild Alaska. Inian Islands Institute brings scientists and student groups for field-based courses among the mountains, glaciers, and fjords of Alaska, focused on environmental leadership. As part of this project, in the summer of 2014 Zachary set off from Stanford University for a 4-month, 2300-mile solo trek up the Pacific coast to Alaska, on foot and by kayak - and he looks forward to sharing his photos and stories from that grand adventure with you. RSVP encouraged but not required. RSVP today. Instead Join us for the Olympia Mountaineers Annual Banquet on October 29. Robert Kandiko, American Alpine Club's 2016 award recipient, will share his Denali rescue experience and lessons learned from mountaineering. Purchase tickets in advance (ticket link will be posted when available. Mountaineer's banquet will be at the Worthington Center, St. Martin's University. Come take a slideshow hiking tour around the Olympic Peninsula, Grays Harbor and Long Beach Peninsula with award winning guidebook author Craig Romano. Drawing from his long-awaited for and newly released Second Edition Day Hiking Olympic Peninsula (Mountaineers Books); Craig will introduce you to a diverse array of trails on the Olympic Peninsula. Craig hiked more than 2000 miles researching this book from easy nature trails to wilderness romps. This all new completely revised and updated volume contains 136 hikes, including many found in no other guidebooks. Many of the hikes from the previous edition have been greatly expanded providing for even more hiking opportunities. Please join us for an evening with local author and paddler Susan Conrad as she shares stories and images from her solo sea kayak journey up the western seaboard. She’ll talk about the magic and mayhem of paddling to Alaska—and writing a book! Come listen to this story of the sea and the soul. Susan will also read from her recently published memoir "INSIDE: One Woman's Journey Through the Inside Passage." Hardcover copies will be available. Get yours autographed at the event! Homegrown Olympia Mountaineer Michael Walther traded his college years for the chance to hike America's longest mountain trails. Join him for a romp along the Pacific Crest, Appalachian, and Continental Divide trails, a total of 7500 miles. See some of our most celebrated national parks, towering mountain ranges, lush forests, and friendliest towns through the eyes of a young thru hiker. Along the way you'll meet fellow hikers and generous Trail Angels, camp in a restroom, get a very unfortunate tick bite, and find a mysterious burlap bundle in the desert. What's more, you may discover a long walk in your future! 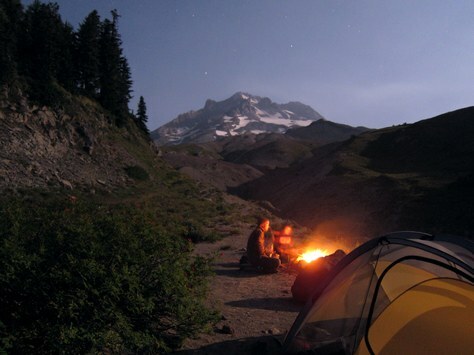 Hiking the Pacific Crest Trail: Oregon is written by Eli Boschetto. A guidebook author and website editor based in Portland, OR, Eli has been writing and photographing trails in the Northwest for more than 10 years. He has served as a Northwest trail correspondent for Backpacker, and is the former editor of Washington Trails. The adventure speaker series is coordinated by Carolyn Burreson. If you'd like more information or if you are interested in speaking, please contact Carolyn. No meetings in the summer months, June, July, or August.